Suspected Islamic State commander Fehmi Lassqued is presented to the media prior to his deportation. 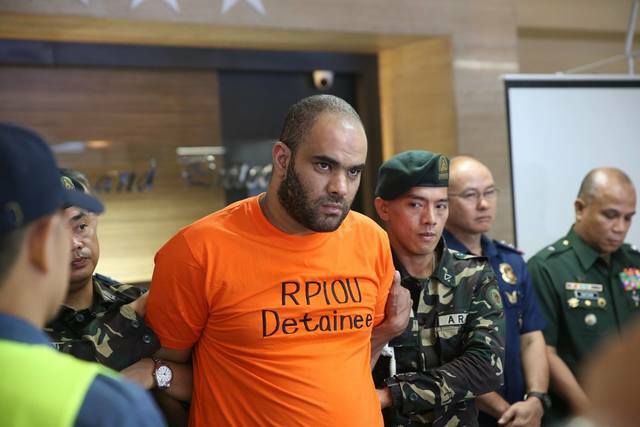 An Egyptian, suspected of being an Islamic State commander, has been deported from the Philippines due to visa irregularities. BI Commissioner Jaime Morente said today (Tuesday, October 16) that Fehmi Lassqued or Haythan Abdulhamid Yusof, aged 33, was deported to Cairo, via Bangkok, 10 days ago. He has since been taken into government custody in Cairo. Lassqued was found to have used an altered Tunisian passport when applying for a work visa with a fictitious employer. The Bureau of Immigration (BI) also said he was an undesirable alien due to his suspected terrorist links. Mr Morente said Lassqued is now placed him in the BI blacklist to prevent him from re-entering the country. He added that Lassqued’s arrest was a “big accomplishment” for the BI. “The arrest and subsequent deportation of Lassqued is definitely a big accomplishment of the bureau. “We have strengthened our Anti-Terrorist Group, which actively coordinates with local and foreign counterparts to ensure that we keep our country safe from these foreign terrorists,” he said in a statement. As we reported in February, Lassqued and his Filipino girlfriend were arrested in Ermita, Manila, after the police and Army allegedly seized a gun, explosives, an Islamic State (IS) flag and maps. Police investigations suggested that Lassqued was a negotiator for the IS in its dealings with local government officials in Syria and Turkey. He was also believed to be an IS commander operating on the Syria-Turkey border. However, in March the criminal complaint against Lassqued was dismissed by the Department of Justice due to lack of evidence and doubts over the police account of his arrest. Despite this, Mr Morente said that because the Egyptian had violated immigration laws, a deportation proceeding could go ahead. “Despite the dismissal of the criminal complaint, we saw that Lassqued definitely violated Philippine immigration laws, which prompted us to assume jurisdiction over his case so he may be subjected to deportation proceedings. As a result, he remained in detention until he was deported,” he said.